Is the Fed’s monetary tightening about over? Maybe, maybe not but there does seem to be some disagreement between Jerome Powell and his Vice Chair, Richard Clarida. Powell said just a little over a month ago that the Fed Funds rate was still “a long way from neutral” and that the Fed may ultimately need to go past neutral. Clarida last week said the FF rate was close to neutral and that future hikes should be “data dependent” which makes this observer wonder what exactly past hikes were predicated on if not data. Maybe Powell’s thinking has changed since he made those remarks and he sent Clarida – and a few others – out to deliver the message that monetary policy is no longer on auto-pilot. Or maybe the bulls just want that to be true. Yes. And my admiration for Chairman Powell rises again. The speech he gave at Jackson Hole a few months ago may turn out to be one of the most important in the history of the Fed. He made it clear that while his predecessors may have depended on their academic models, he would not. And with his speech to the Economic Club of New York today he proved it. It has been obvious for some time now that the “booming economy” narrative was kaput. Our Jeff Snider has been writing about it for months and the market has been signaling it as loudly as it can. Powell finally got the message. It would have taken a crash for Bernanke or Yellen to believe the market over their models. I think Powell got pretty much what he wanted from this tightening cycle; or at least this part of it to date. The economy has slowed from the tax cut induced spurt but not so much that it raises the risk of recession significantly. Stocks and junk bond valuations have corrected somewhat but not so much that it should impact confidence. So far, so good I’d say. 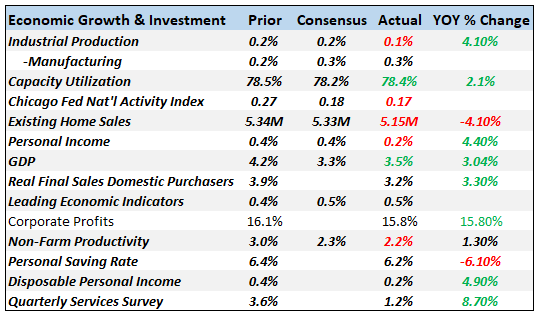 And while there is a soft tone to the economic data releases of the last month, the overall picture is still one of an economy growing slightly above trend. Maybe a little less above trend than last month but still, above trend if you take trend to be 2-2.5% GDP growth. I never bought the idea that the 3% growth of the last couple of quarters was sustainable so the idea that growth is falling back to the low 2s just isn’t a big surprise. There have been a litany of one off events over the last year that made GDP growth look better than the underlying trend. We should call the last year – with rebuilding from four hurricanes, front running of tariffs and a federal budget blowout – the Potemkin economy. It looks okay on the surface but there isn’t any depth to it. And I think we’re about to find out what it really looks like behind the facade as those three big artificial stimuli wear off. Our market indicators were already pointing to the need for a pause before Powell talked. Short term interest rates were pulling back, inflation expectations waning. Interestingly, real rates haven’t been affected much recently meaning that real growth expectations have been fairly steady. That, again, seems like an almost ideal outcome for Powell – inflation contained in a way that leaves real growth unaffected. The markets were obviously thrilled with Powell’s verbal guidance. What remains to be seen is if this will be anything more than a one day or one week move. There are some definite warning signs in the economic data, especially with housing. 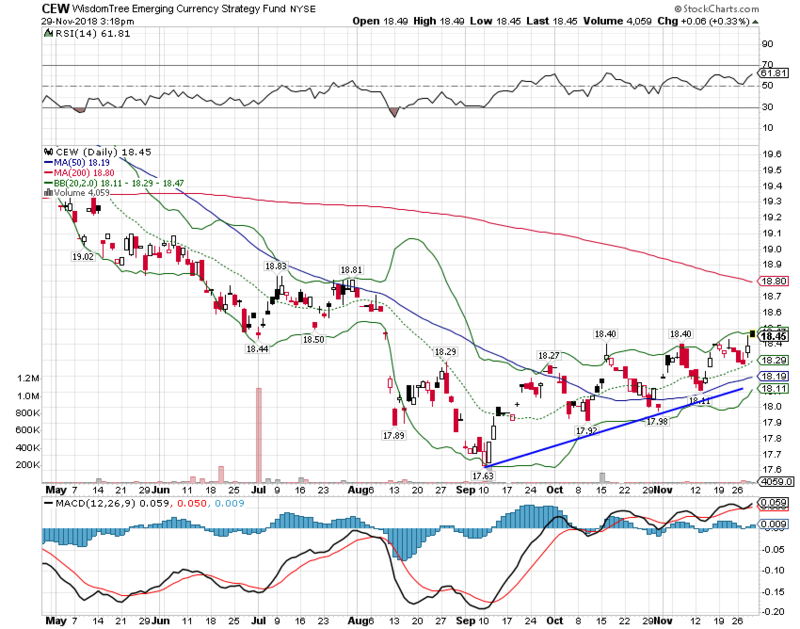 Capital spending is also worth watching closely with oil prices down so much from the highs. We have become too dependent on high oil prices and the growth in shale production for my taste so I welcome a slowdown in drilling. But ultimately we’re going to need more investment to sustain economic growth and right now we aren’t really getting it. The next big event is the G-20 meeting where China and the US will finally face off over trade. Expectations are building for some kind of deal but I’m still skeptical. Blaming China for whatever ails the US economy is a proven political winner for both parties and especially for President Trump. I wouldn’t expect him to give that up without something tangible and big. Expectations have been building for a deal so lack of one could be a big disappointment – for good reason. Tariffs are taxes and raising them has consequences for economic growth. Q3 GDP was a little better than expected but the details were not nearly as positive as the headline. Growth was heavily skewed to consumption and while investment was also higher it was concentrated in inventory accumulation. Highlighting the troubles of the housing market, residential investment fell for the third quarter in a row and for the 5th quarter in the last 6. Business investment was up 0.8% but that is a steep drop off from the 11.5% rate of the previous quarter. Existing home sales missed expectations for the 6th month in a row although there may be some hurricane effects still. Regardless, there is obvious stress in the housing market whether existing homes or new but the impact on the overall economy so far is fairly minor. Housing activity has been slowly but steadily rising since the financial crisis but never really fully recovered to previous levels of activity. There is, however, a bit of silver lining in that. No boom probably means no bust either. It is a negative but probably not one that is large enough to put us in recession. 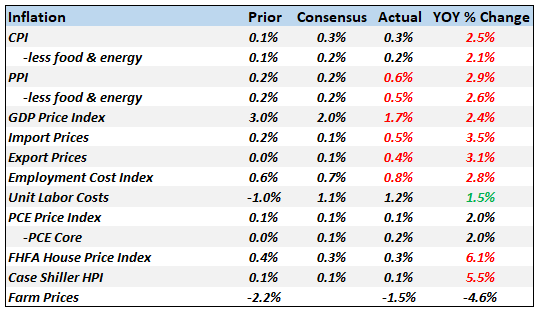 The Chicago Fed National Activity Index really tells the story in this section. The CFNAI has been showing an economy growing slightly above trend for some time and that hasn’t changed. The three month average is 0.21, way above the -0.75 that usually precedes recession. Call it the new normal or whatever you want but after all this time maybe we should just drop the “new”. These sentiment style surveys have moderated some recently but all of them are still pretty positive. One thing to note is that the comments on the ISM reports are full of negative references to tariffs. Companies are definitely being impacted. Consumption was the big winner in the GDP report and we see it here too. Retail sales have been decent although there are some gas price impacts that are about to go away. Consumer spending rising 5% year over year is okay but not great and that confirms the idea that growth is just around trend. Inventories are rising and inventory/sales ratios are stabilizing at these levels. I’m actually surprised we don’t see a greater impact from tariffs and fear of more. But then consumers respond to an expected change in the tariff level too. A tariff is essentially a consumption tax and if people know it is going to rise they buy ahead of the change. If you doubt that go and look at what happened in Japan a couple of years ago when they raised their consumption tax. The economy had a spurt of growth before the tax rose and a deep fall off immediately after. We probably won’t have as big a swing since the tariffs aren’t on everything but there has to be some impact. 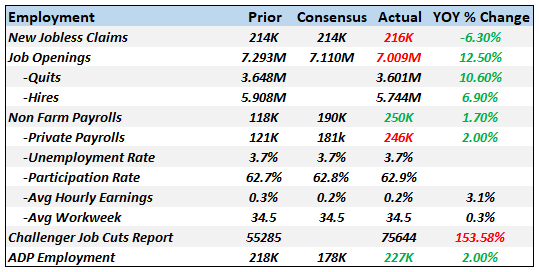 Durable goods orders were goosed higher by defense aircraft orders but the ex-transportation numbers were disappointing. Core capital goods orders too were negative and year over year rates of change are slowing. It looks like whatever investment gains we got from the tax cuts is already fading. Both imports and exports look pretty good but I don’t know how you can separate out any tariff effects. Almost all the inflation figures are moderating and are right around the Fed’s target. The Employment Cost Index did rise at the fastest rate of this expansion but how that translates in the economy as a whole is hard to say yet. It could hit margins if companies are unable to pass through the higher costs. House prices are also moderating as one would expect with sales lagging. Falling farm prices are almost all about the retaliatory tariffs. The employment picture hasn’t changed much but new claims are starting to rise a bit and the Challenger layoffs are worrisome. There just isn’t any good news here. Housing is in a slump and it does not appear to have hit bottom yet. Maybe if rates come down home sales will stabilize but I think the bigger problem is still on the income side. Incomes just haven’t kept up in this expansion and there’s little evidence that is changing. Prices are going to have to adjust more. Sentiment is still positive but coming off the boil a bit. As I’ve said many times though sentiment is the ultimate coincident indicator and tells us nothing about the future of the economy. The 10 year Treasury yield briefly traded under 3% in the aftermath of Powell’s speech. Momentum is obviously down for now but this move from the 3.25% area has been almost exclusively about falling inflation expectations. Most of that drop was driven by falling oil prices and at least in the short term I think we are probably near some kind of bounce in crude prices. As I said, the drop in the 10 year Treasury yield is almost all about inflation expectations. 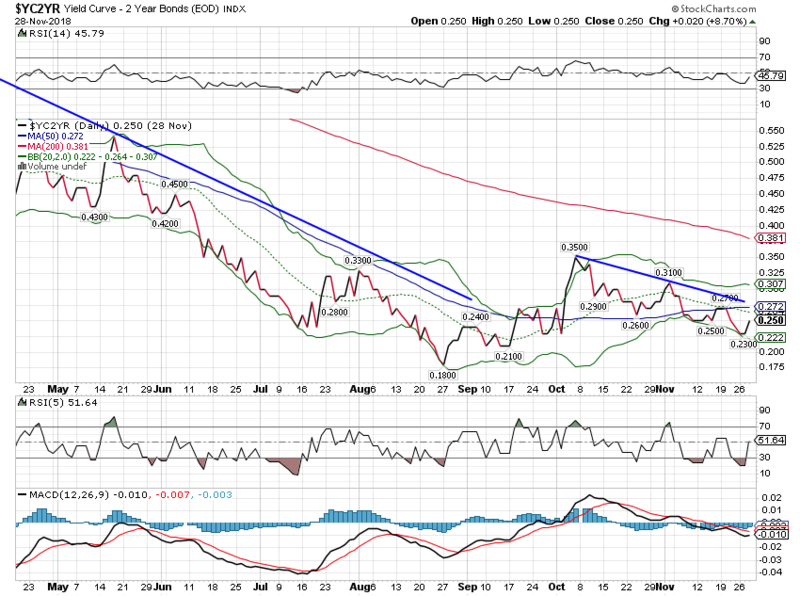 As you can see here, the 10 year TIPS yield has been steady to higher and is in an obvious uptrend. That is positive from a real growth standpoint. The 2 year note yield was falling before Powell’s speech as expectations for future rate hikes were already fading. As I’ve said many times, the Fed follows the market not the other way around. The yield curve has resumed its downtrend and Powell’s speech didn’t change that. At 25 basis points the curve is telling us little. We aren’t inverted or close to it and the curve is not acting as we would expect prior to recession. Credit spreads have finally moved wider and have now broken out of the old channel near the lows. Still the widening pales in comparison to the widening we saw in 2015/16 as the shale industry imploded on lower oil prices. The shale companies and their bankers are better prepared this time around and a lot of the weaker players are gone through bankruptcy and M&A. The chart below plots the year over year change in HY credit spreads versus the year over year change in the Russell 3000. As you can see, stocks don’t act very well when spreads are widening. Just a warning for now but keep an eye on this one. The dollar pulled back on Powell’s speech but the trend here is pretty obvious too. 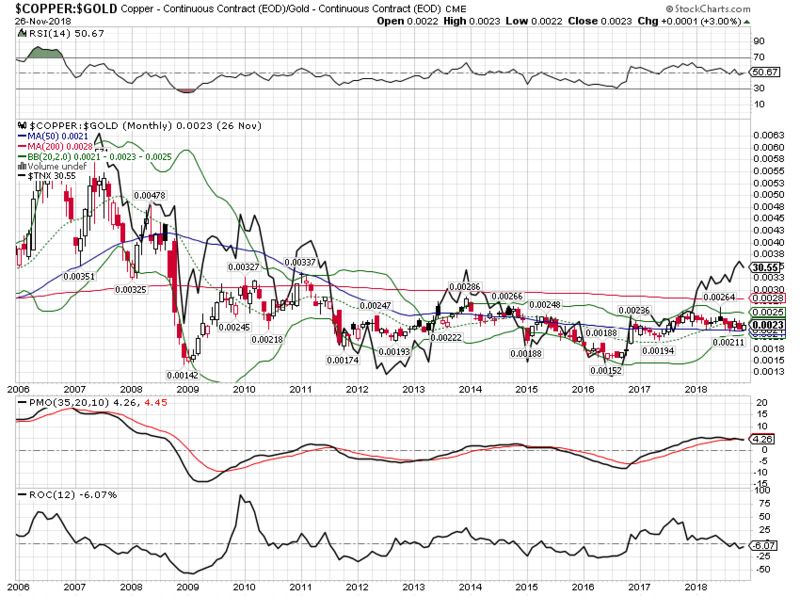 I have thought for some time that the dollar is overvalued and that the uptrend since 2009 should be coming to an end. That looked like a good call last year but the buck has now recovered about half of last year’s losses. Longer term the dollar index is flat since about 2015. 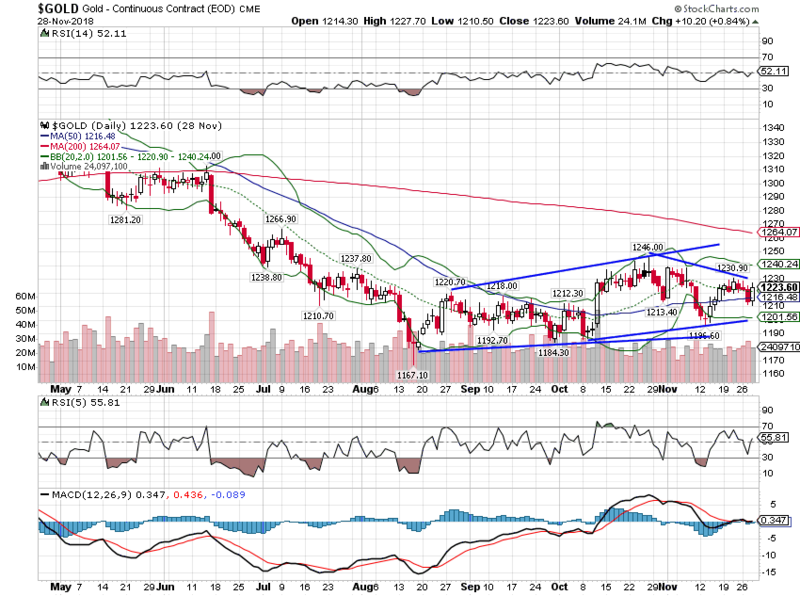 Another subtle sign of potential dollar weakness is gold which is also in a short term uptrend, albeit a very choppy one. The big news in commodities has been the collapse in crude oil prices which have just gone straight down since peaking in the mid-70s. 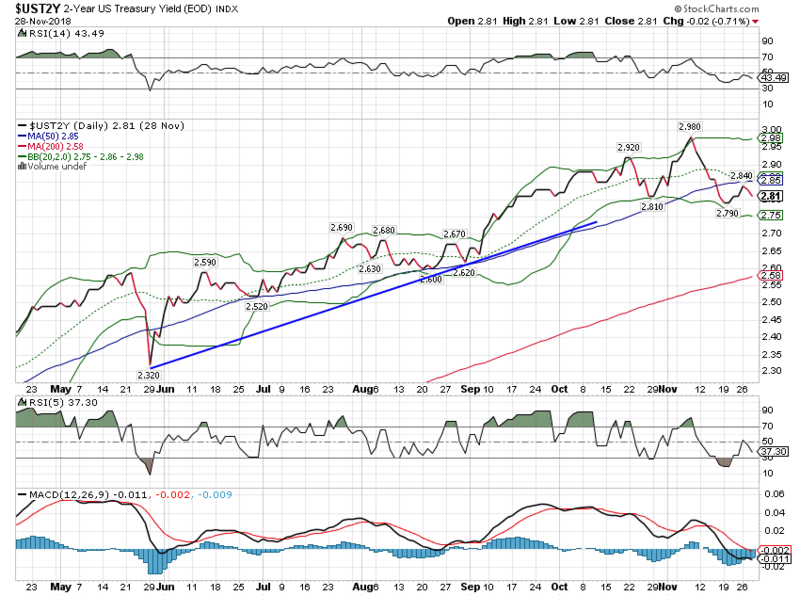 The blue line in the chart below, by the way, is the 10 year Treasury yield which tracks crude prices pretty closely. 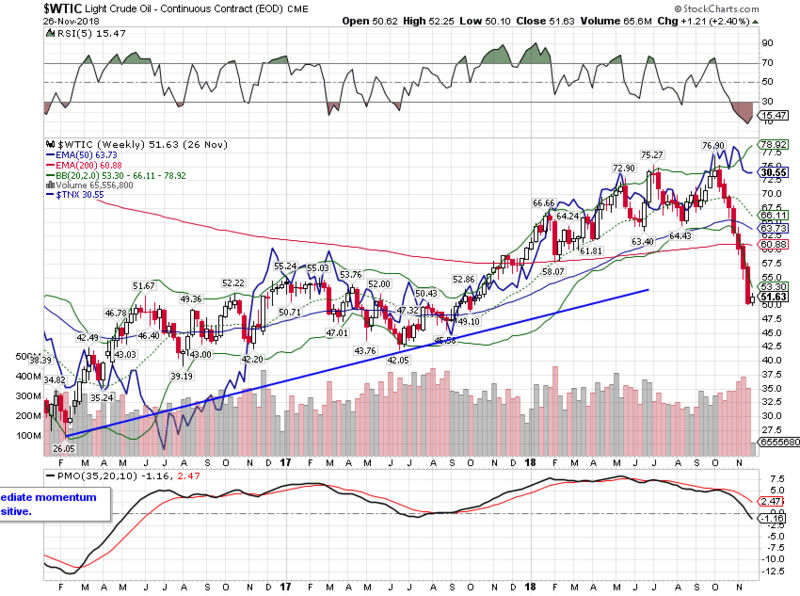 Considering the oversold nature of crude I’d expect to see that gap closed, at least somewhat, by a rebound in crude. 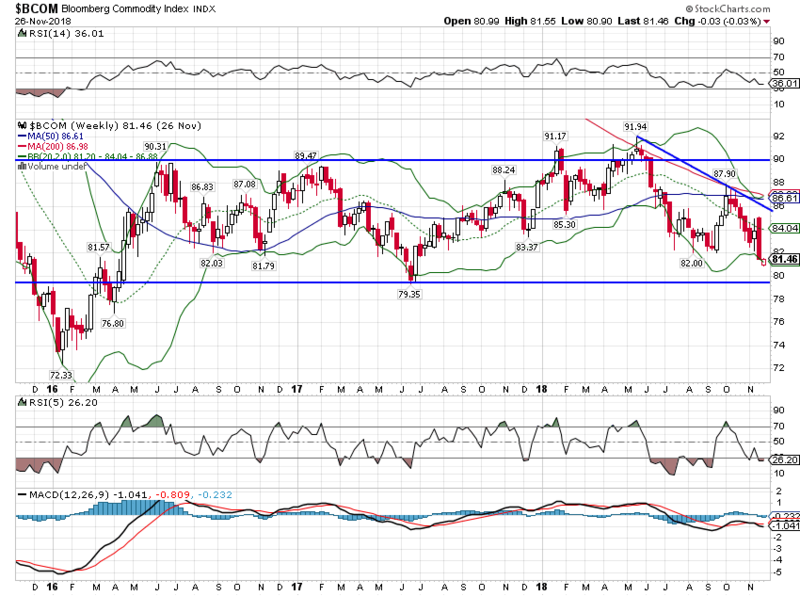 If yields fall instead the rate that corresponds to this level of crude prices is around 2.25%. 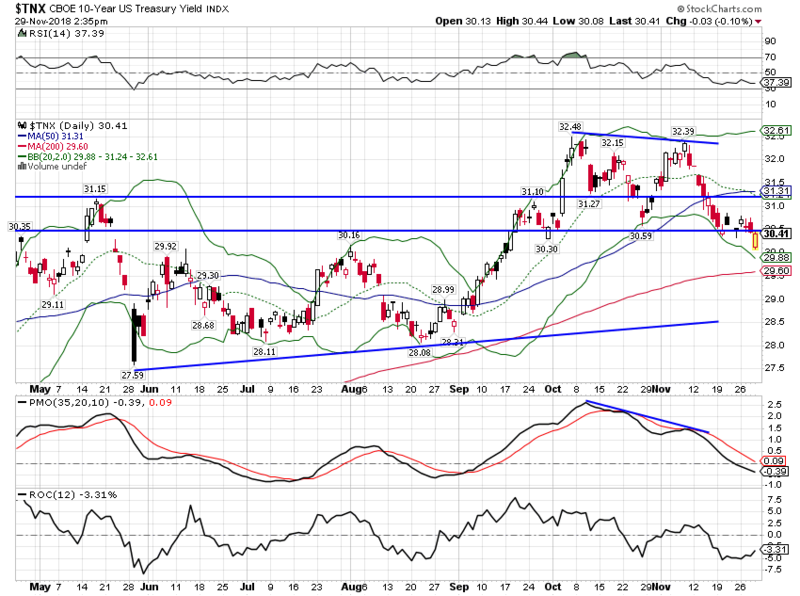 Think for a minute about what would have to happen for the 10 year yield to fall that far. Not a pretty thought is it? 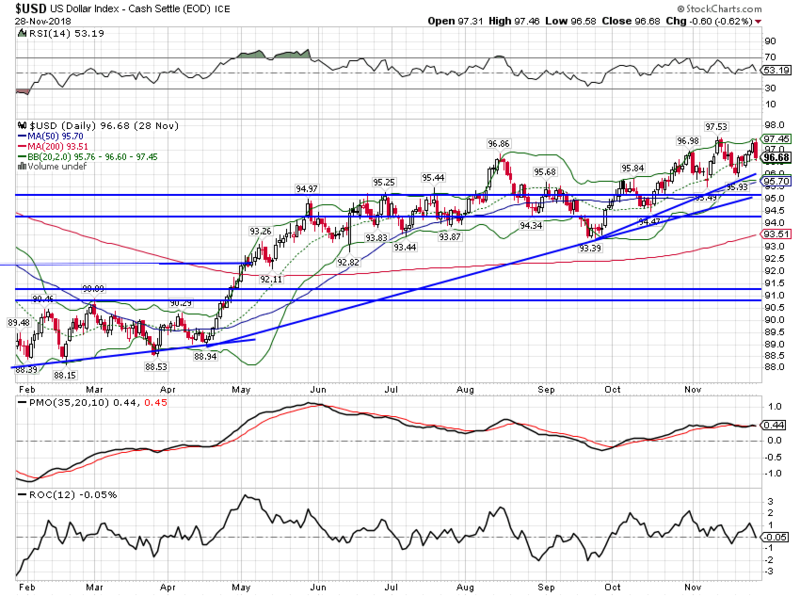 The GSCI, heavily weighted to crude, has also fallen, although one could still make a case for a longer term uptrend. 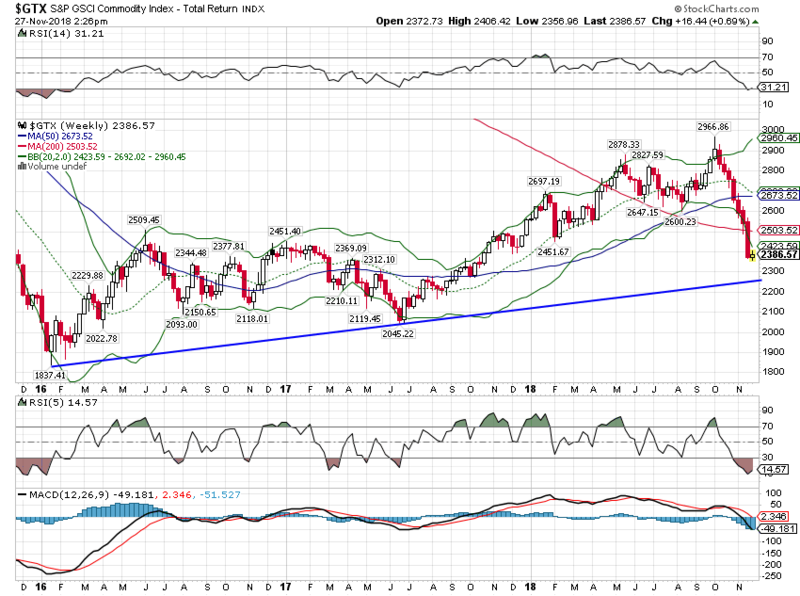 The Bloomberg commodity index is more equally weighted so the damage there is not as bad. The copper/gold ratio, like crude oil, argues for a bond market rally. As for the former, that’s exactly what the Fed should do – respond to changes in market based indicators of economic health. Chairman Powell, unlike his predecessors, is not trying to set monetary policy based on what he or the staff’s models think should be happening but rather what is happening. That’s why I said above that his Jackson Hole speech may be one of the most important in the history of the Fed. Powell is pragmatic and humble, traits we haven’t seen in a Fed chairman in a long time. He knows what he doesn’t and can’t know. The economy is slowing somewhat right now but that shouldn’t be surprising. I said last year that the changes in the tax code just weren’t big enough to raise growth much and that has proven true. Now that the short term benefits are wearing off, growth is falling back to the previous trend – with a bigger debt and deficit. But going back to trend isn’t a recession either. It’s just…normal.